Take courage, God’s promise is the same as when bringing Israel out of Egypt. Image of God shaking the treasures out of the nations and building something beautiful. Tune In The desert will spring to life / Making things new (Anderson). A catchy pop song. Great for kids, and excellent imagery. Sound sample, lyrics and songbook. Good for kids. AoV1-095 / G(II)324 / GC459 Envia Tu Espíritu My other favourite holy spirit song. A catchy latin rhythm; verses are in English and the chorus is Spanish – not too hard for non-Spanish speakers, though. ATA 114 Come my brother come my sister (McCarthy) Nice and easy to sing. Has a repeated line of "come, my brother, come", which would be better alternated with "come, my sister, come". Great words of hope about the Promised Land. AoV1-114 / ELW388 / HPP376 / G(II)430 / GC608 / GC(II)596 / G(3)683 / W&R430 / Lau964 You shall cross the barren desert / Be not afraid (Dufford) Beautiful words. Well known (at least, the chorus). Verses may be tricky. Lyrics. TiS 100 / AHB 3 / NCH017 / CH147 / UMH62 / VU217 / LBW527 / ELW835 / A&M532 / GA395 / HPP261 / GtG020 / PH455 / GtG015 / GC534 / GC(II)523 / G(3)611 / CP(E) / 250 / W&R23 / Cha022 / 82Hml-400 / Lau694 / StF099 / MP007 All creatures of our God and King (Francis of Assisi) A good classic sing! Hymnals vary a LOT in their translations and verses included. 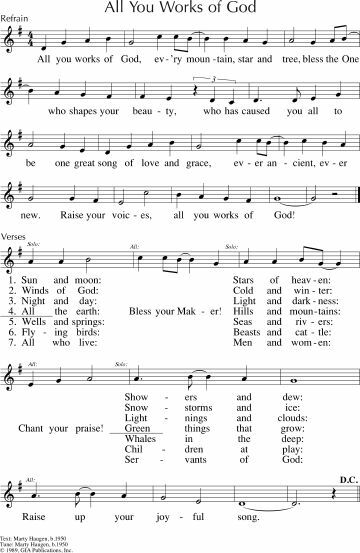 Using only Alleluia Alleluia or "Sing your praises" as some hymnals do, eliminates the "Oh praise him" which makes it annoyingly male exclusive. 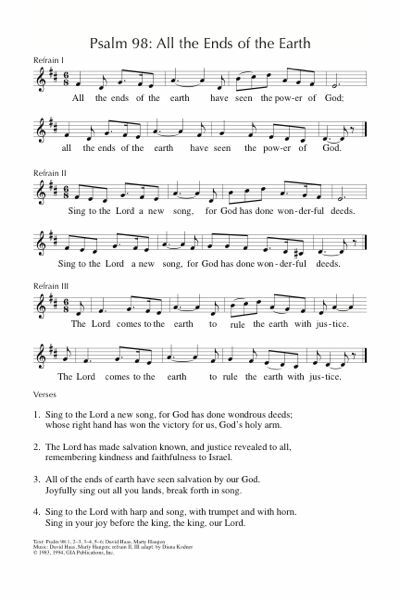 NCH has "To you, O God, all creatures sing" and eliminates all kingly language. ELW has "All creatures worship God most high". Lyrics and sound sample. Oldy-but-a-goody. TiS 152 / NCH4 / UMH89 / VU232 / LBW551 / ELW836 / HPP22 / GtG611 / PH464 / GC529 / GC(II)520 / G(3)614 / CP425 / W&R59 / Cha002 / URW065 / 82Hml-376 Joyful joyful we adore thee Note that this hymn is not always very inclusive. I prefer more modern translations (e.g. TiS, VU, NCH, GC(II) ). Older version lyrics and tune sample. 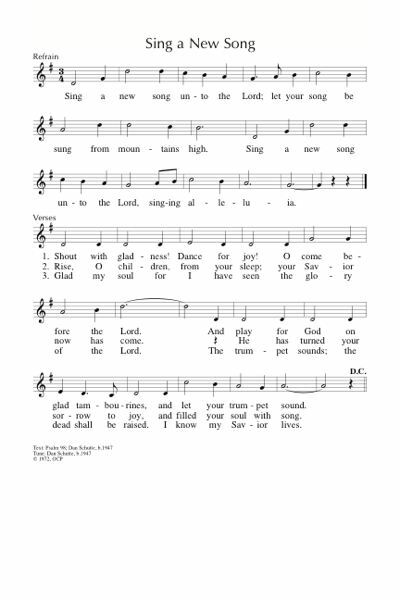 GtG042 / PH251 Your Faithfulness O Lord Is Sure (Patterson) Very simple paraphrase of this Psalm, sung to the familiar traditional tune WINCHESTER NEW. New words to old tunes. MV048 I can feel you near me God / Jump for joy (Mayberry) Good song for smaller kids about God being with us. I reckon you could get the kids to Jump in the chorus. Maybe it's a bit too happy clappy for some? Good for kids. Sound sample. SFFS 2040 / GtG616 / W&R658 / ZSS7 / Srce547 / StF062 / MP1005 Our God is an awesome God (Mullins) Anthemic, gutsy; makes me want to do air punches, but maybe that's just me. If you change "He reigns" to "who reigns", as GtG does, it's inclusive. Good for kids. Job knows that God is still alive, and that after death, Job will see God! TiS 376 / AHB 299 / TOSB090 / CH423 / LBW352 / ELW619 / G(II)619 / GC430 / GC(II)454 / G(3)527 / StF303 / MP202 I know that my Redeemer lives (Medley) A classic; not a great favourite of mine, and I'm not sure that Job was actually singing about Jesus, but we can. Oldy-but-a-pretty-goody. Recorded music (or choral) When I die tomorrow (Sweet Honey in the Rock) This song would fit very well, and there are some great choral arrangements of it. Sweet Honey's version is pretty tricky, here's a brief sample! Asking for God to listen; God testing and trying and visiting by night, but the Psalmist has been faithful. I shall behold your face and be satisfied when I wake and see it. 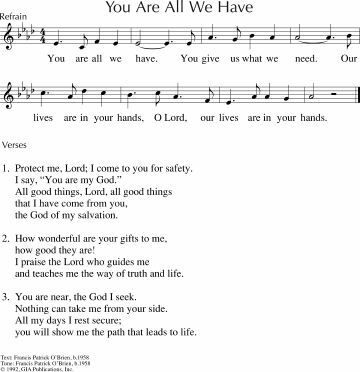 *NCH Psalter has a good translation of the Psalm and a simple lovely refrain from Jane Marshall. *GtG211 Hear O Lord my plea for justice (Morgan) Excellent words set to a simple flowing tune; words are a little formal. TiS006 Lord when your glory appears my joy will be full / O Lord hear a cause that is just This cantored Psalm is very beautiful. There is something about it that is quite formal and reverential without being pompous. MV214 May God's sheltering wings (Snowdon) A nice simple blessing and benediction, which may be sung about a feminine or a masculine God. Lyrics (downloads a pdf). *GtG211 Hear O Lord my plea for justice (Morgan) A very nice lilting tune, and good words that gently paraphrase this Psalm. VU739 Guard me as the apple of your eye (Hopson) A nice refrain for this Psalm. *URW238 Keep me keep me as the apple of your eye (Marshall) Very simple refrain for this Psalm, read responsively. *ATFG575 / VU400 / WoV775 / ELW752 / SFFS 2193 / GtG469 / HPP403 / W&R489 / Cha305 / ZSS156 Lord Listen to Your Children Praying (Medema) A simple, repetitive song which would be fun to play around with - you could do it fast or slow. Sheet music sample. Youtube sound sample (album version. G(II)24 / GC25 Lord When Your Glory Appears (Stewart) A simple and good refrain. Lyrics and melody line. Sound sample. TiS 47 / AHB 46 / AoV1-175 / NCH25 / CH161 / UMH117 / VU806 / LBW504 / ELW806 / GA459 / A&M746 / HPP1 / GtG687 / PH210 / GC614 / GC(II)588 / G(3)688 / CP528 / CP(E) 537 / W&R84 / Cha067 / Srce2-441 / URW200 / 82Hml-680 / PfAS090B / Lau955 / StF132 / MP498 O God our help in ages past (Watts) A good solid very well known hymn! The surprising thing about this one is that the language is inclusive for God in most sources. Not all sources are inclusive for humanity, so check. Lyrics and sound sample. Oldy-but-a-goody. Looking forward to Christ’s return. Stand firm; don't get led astray. TiS 590 / AHB 165 / AoVK-117 / NCH506 / UMH526 / VU663 / LBW439 / ELW742 / HPP408 / GtG465 / PH403 / CP532 / W&R473 / Cha585 / Srce 776 / StF531 / MP746 What a Friend we have in Jesus There is a bit of masculine language, but the song has so many other good things about it. I like both tunes. AOVK has different lyrics, written specifically for kids, which I think are worth singing. Good for kids. Oldy-but-a-goody. *TiS 412 / AHB 324 / ATE 251 / G(II)328 / GC468 / CP651 / W&R130 God sends us the Spirit to befriend and help us / Spirit Friend I like this song from Malawi, but the lack of inclusive language for God sometimes drives me a bit crazy. 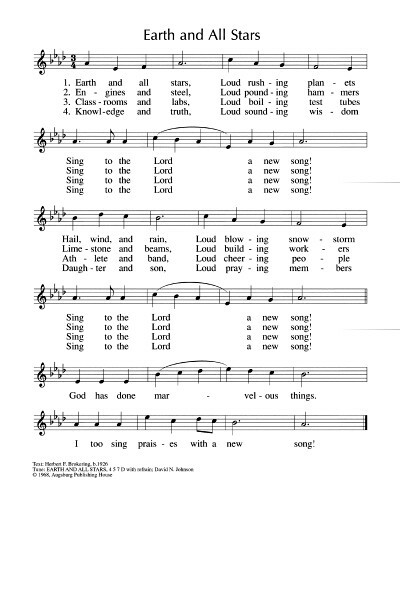 In Tom Colvin's book "Come Let us walk this road together" he uses more inclusive language than many hymnals. That is, he writes “God sends us the Spirit” instead of “God sends us His Spirit” and "Spirit of our Maker" rather than “Spirit of our Father”. Good for kids. Less inclusive lyrics and a strange sound sample. VU718 / PH431 / W&R620 O Lord You Gave Your Servant John (Patterson) Terrific words contrasting the wealth and poverty contrasts in earthly cities with the Holy City. 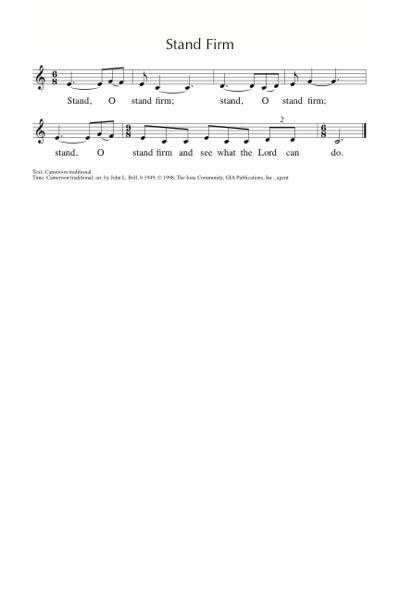 Sung to ST. PATRICK'S BREASTPLATE or CANDLER. BUC Song Project When my life is hard / God's Presence (Scull) Simple words of God's strength in the midst of difficult times. Easy tune. Also, it's good for kids. Strange question about woman marrying 7 brothers, and what happens in the afterlife. God of the eternal. God of the living! TiS 90 / AHB 44 / UMH60 / VU867 / GtG806 / PH253 / A&M673 / CP346 / CP(E) 473 / W&R79 / Cha20 / 82Hml-429 / StF079 / MP320 I'll praise my Maker while I've breath (Watts) A great classic hymn. Most sources are not inclusive; Voices United is! Lyrics and sound sample. Oldy-but-a-goody. ATOK 320 / NCH351 / VU645 / StJ / WoV770 / ELW732 / SFFS 2051 / GtG488 / HPP516 / W&R680 / Cha075 I Was There to Hear Your Borning Cry. (Ylvisaker) A song of God’s presence in all stages of life. Very simple tune to sing. This always makes me think of Center Church on-the-Green in New Haven, CT. Lyrics, and a nice (slow) sound sample. *TiS 182 / AoV2-010 / NCH11 / CH134 / VU268 / GtG760 / SFFS 2047 / HPP13 / CP395 Bring many names beautiful and good (Wren) This is a beautiful song, but it's very long (especially if sung too slowly). Try singing one verse unison, then one women, one men, then all together again, to keep people interested in what they are singing. Lyrics. *TiS 548 / VU629 / A&M014 / PH340 / CP(E) 415 / W&R418 / SP3 / 82Hml-465 Eternal light shine in my heart I really love this beautiful inclusive and ancient prayer. 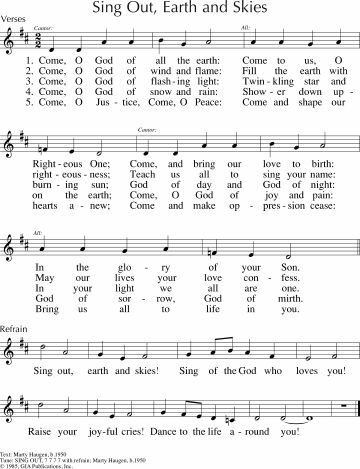 It is not familiar, but would be beautiful sung by a soloist until your congregation grows to know it. *AoV2-068 / VU695 God is passionate life (Fulmer) Good simple round with a peace / justice focus. Good for kids. *Tune In Come O God and visit us sick we pray / Your abundant life (Brown) A joyful song "Lead us into your abundant life". Lyrics and sound sample. "What a Friend We Have in Jesus" is listed as Voices United #663. Should be #664. I love your site...it has helped me many times.